The Government of Ghana is planning to invest in the textile sector of the country. 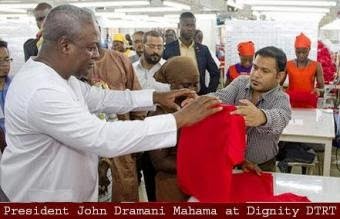 The President of Ghana, John Dramani Mahama, who visited Dignity DTRT, a garment company in Accra, said the Government is taking steps to invest in the local textile industries to promote it in the international market, Ghana news agency reported. He commended the management and staff of Dignity DTRT for the good work they were doing and promised that the Government would support them to improve production to enable them to provide more jobs for the youth. The President said the visit was the first step in encouraging Ghanaian textile companies to improve production. He said the move was to help in the reduction of importation of textile goods and to create many job opportunities in the Ghanaian textile sector. He said the Government of Ghana would also help revive the cotton industry to ensure that most of the lint is produced in the country and reduce the exportation of primary goods to other countries. The President also asked the manufacturing companies to increase their production to meet international standards. Since the cotton industry in Ghana serves as the raw material base and is receiving a good response, the Government of Ghana plans to extend its focus to finished products. Dignity-DTRT, which is a joint venture, currently manufactures garments for the US market, with a workforce of 500 people.